Privately owned, it is possibly the largest classic MV Agusta motorcycles’ collection in the world, and it will be up for auction at the prestigious Rétromobile exhibition in Paris. As true pieces of motorcycle art, the machines will be on display and viewable by the public in hall 2.2 at the Paris Expo Porte de Versailles fair. The show opens today, while the auction itself will take place on Saturday February 9th, at 2.00 PM. Both the exhibition and the auction are curated by Artcurial. Through unique pieces, prototypes and racing models, the collection retraces the history of the MV Agusta brand, from the years immediately following the end of World War II through the 20th Century and well into the new millenium. An exciting exhibition with some pieces possibly reaching hundreds of thousands of euros at the auction, as the two 1975 750 prototypes, or the 750S, designed by the legendary Arturo Magni, which belonged to Formula 1 pilot Arturo Merzario. “Our bikes are the most collectible in the world, and we’re happy to see that exchanges between collectors are on the rise” said Timur Sardarov, CEO of MV Agusta. He added “although the company is not directly involved in the event, we are excited that our brand and its history will be so splendidly represented at this prestigious venue. We welcome Artcurial’s initiative and we appreciate the high degree of professionalism as well as the passion that went into organising the exhibition and the auction”. 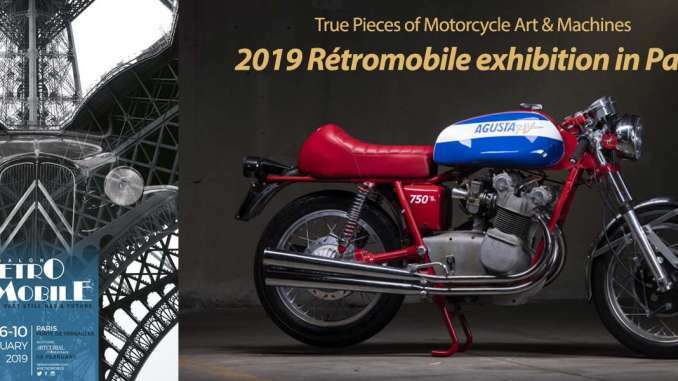 New in 2019: The 2019 Paris Rétromobile Exhibition show opens a space for the sale of collector motorcycles! 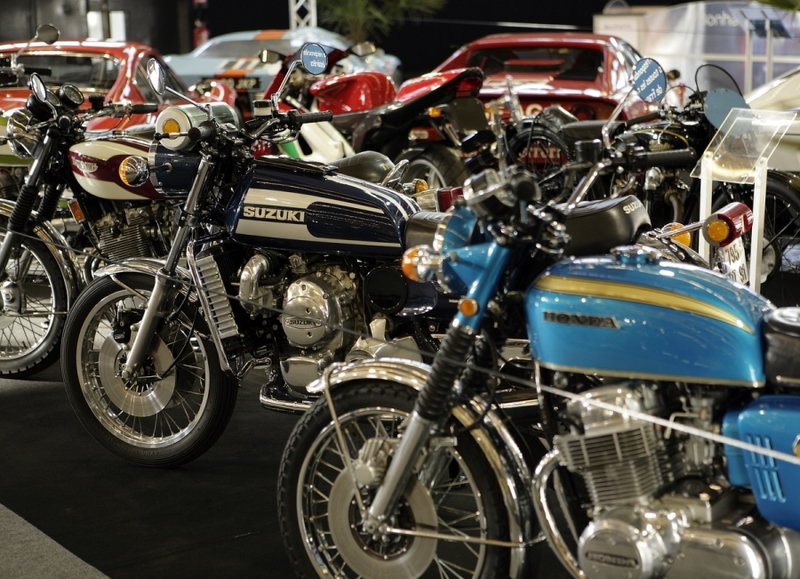 Each year, tens of motorcycles are present on the stands among the other vehicles, Rétromobile wanted to create an exhibition space that will be dedicated to them. Hall 2/3 will be devoted to the world of motorcycles, there will be a space sale of collector motorcycles for professionals and individuals, exhibitors and a thematic exhibition gathering rare models and tracing the adventure of a constructor. Two wheels, four wheels, a story and a passion that come together. Sell: your motorcycle over 30 years, visible 5 days by more than 120 000 buyers. 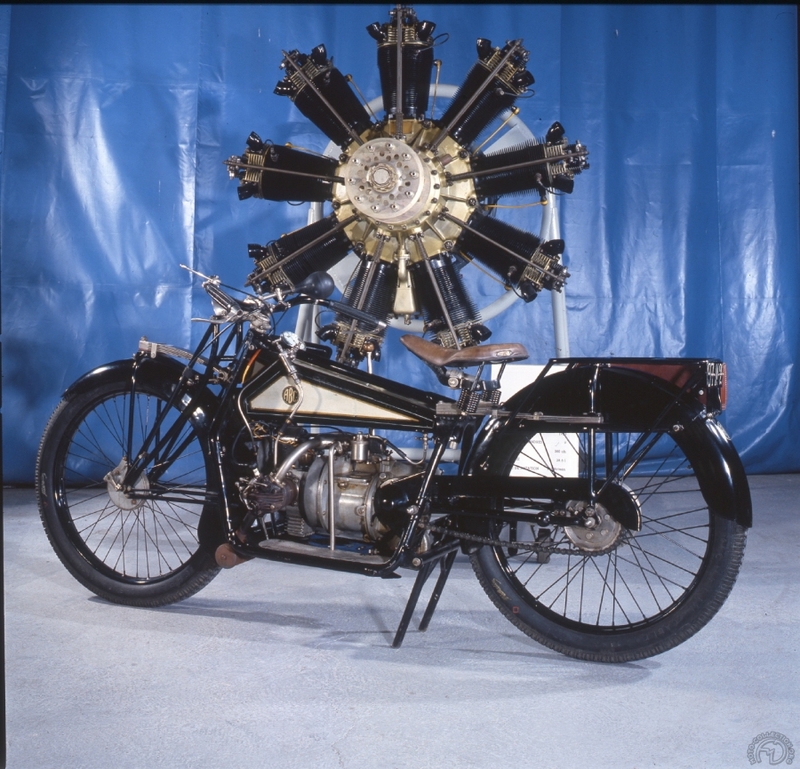 From 6 to 10 February 2019 at the Rétromobile show, the Gnome & Rhône motorcycle club and Safran museum will be taking a look back at the history of a major French motorcycle builder that is now no more: Gnome & Rhône, an ancestor of SAFRAN. The 100th birthday of the first model built by the firm will be celebrated by an exceptional motorcycle exhibition. Nowadays a major multinational aircraft engine and aerospace company, back in 1915 SAFRAN was a firm set up to rationalise the manufacture of engines for France’s fledgling aerospace sector. The company arose from the merger – at the request of France’s Minister for War – of two rival companies: Gnome, based in Gennevilliers and Le Rhône, which operated in Paris. At the end of the war, around 20,000 engines were designed by the maker. But Gnome & Rhône needed to diversify and so turned its attention to building motorcycles, absorbing the British company ABC which had recently set up in France. The French company took over manufacture in France of the «ABC» or «Type A» motorcycle in 1919. Very much ahead of its time with its pushrod flat-twin engine and both front and rear suspension, Gnome & Rhône’s technicians worked hard on enhancing its reliability and around 3000 were produced between 1920 and 1923. It was eventually replaced by the Type B, this time actually designed by Gnome & Rhône. This machine had a sidevalve single-cylinder engine, and was more conventional and significantly less expensive. It remained in production until the start of the 1930s and underwent a number of changes. 1930 heralded a major change in Gnome & Rhône’s motorcycle production, with a radically new design. The tube frame was replaced by an embossed metal frame, and the separated engine and gearbox were replaced by a flat single- or twin-cylinder engine bloc. This architecture was applied to other models and remained in production until 1944. Things changed dramatically in 1945 when de Gaulle nationalised Gnome & Rhône. Alongside Avions Voisin, the company was absorbed into the SNECMA group, which was made up of several major aerospace companies, including Bugatti and Messier. The motorcycle division started building popular small-cylinder twostroke models. 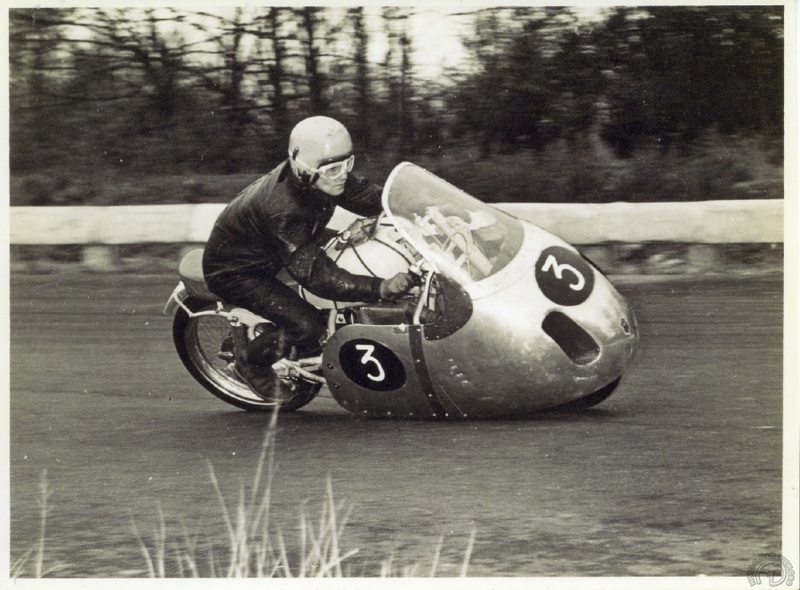 But in no way did they under-perform – as the 175 cc’s victory in the 1956 Bol d’Or endurance race confirmed. At the end of the 1950s, the motorcycle market collapsed, and so SNECMA discontinued production of them and refocused on its initial sector. Henceforth, the company focused on producing ATAR engines for Dassault Aviation’s Mirages. SNECMA went on to become one of the world’s largest manufacturer of aerospace and space engines, and its history continues to this day in the form of SAFRAN, made up of a number of major aerospace companies. This original exhibition will feature over 20 motorcycles in a 400 m² area between halls 2 and 3. 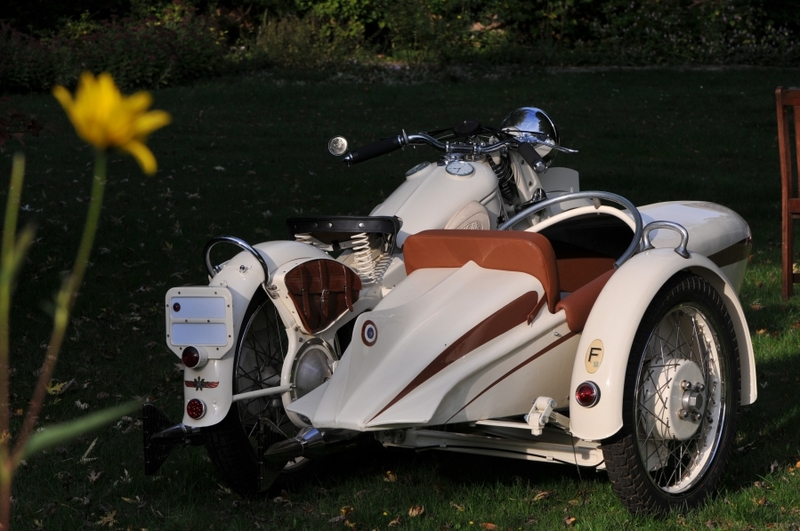 They will include some of the most noteworthy models that the makers ever built, including a 1921 ABC and also a 750 X with Bernardet side-car Avion type, the most prestigious pre-war French motorcycles. Aeronautics enthusiasts are also be in for a treat: Gnome & Rhône’s first ever aircraft engines will be on show. SNECMA will also be exhibiting the three-stage rocket engine that was used with Ariane. 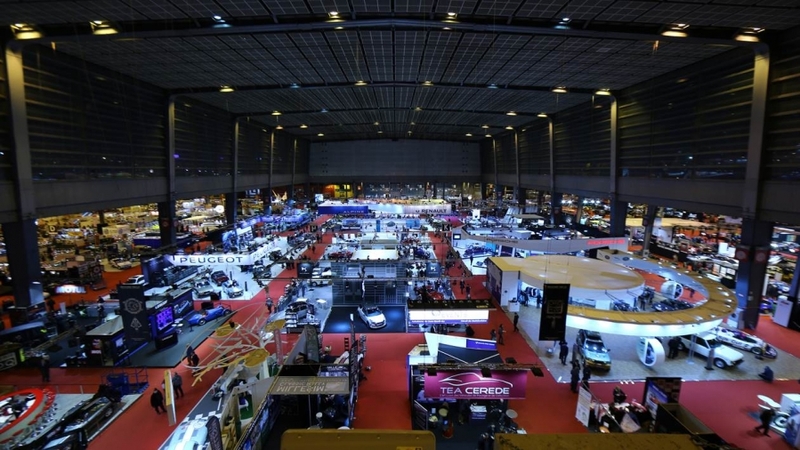 This year, boosted by the continuing success of previous years, Retromobile will be held in pavilion 1, 2 & 3, the largest and most prestigious hall at the Porte de Versailles Exhibition Centre, Paris. More space for exhibitors, more comfort for visitors, more reasons to buy, to dream, to find out information and to admire new and old products at the countless booths. More artists, more clubs, more federations, more spare parts and scale model vendors, more events organisers, more restorers, coachbuilders and car sellers doing their level best to satisfy visitors from the four corners of the world. And there are even more surprises that only this show can offer. Heritage and history meet at Retromobile, where the entire dedicated team is eager to welcome you. Artcurial Motorcars realised in 2018 at the Rétromobile show a total sales of 39M$.